In the beginning there was shame. Now there is baggage. Weigh it. Tag it. Lose it. Claim it. In the National Post, this past Saturday, theatre veteran and Fringe President Derrick Chua was quoted as saying “Baggage” was one of his Top 5 picks for this year’s festival! This past week a special mention of the piece “Touch”, was made in Xtra! Magazine (a LGBT weekly newspaper based in Toronto). “Touch” is just one of the five amazing plays that comprise “Baggage”. Click below to read the article. Categories: Uncategorized . Tags: baggage, coverage, karen ancheta, leon aureus, media, michelle turingan, press, preview, pulang maleta collective, reese baguio, touch, xtra . Author: reesebaguio . Comments: Comments Off on Mention in Xtra! Our “big sister” collective, the Carlos Bulosan Theatre Collective, was nominated for FOUR Doras! On behalf of the PMC, we’re all very thrilled that their amazing work has been recognized. Best wishes to the entire CBT Collective! TORONTO: In 1986, millions of Filipinos took part in the peaceful revolution that toppled the oppressive Marcos regime. 22 years later, the revolution continued at Theatre Passe Muraille with a brave collective of five actors in the Carlos Bulosan Theatre’s PEOPLE POWER. Now, the company is thrilled to announce that the production has been nominated for four Dora Mavor Moore Awards in the Independent Division. “We’re so proud of all of our nominations and everyone on our production team that helped make PEOPLE POWER a success!” raves Nadine Villasin, Artistic Director of Carlos Bulosan Theatre. The award recipients will be announced at the annual Dora Awards taking place on June 30th 2008. This past April, five Filipino performers staged a coup on the Canadian theatre landscape. An homage to one of the most dramatic chapters in Filipino history, PEOPLE POWER explored the lives of ordinary people under extraordinary circumstances during the 1980s People Power Revolution. From the bullet that assassinated opposition leader Ninoy Aquino to the click of a journalist’s camera, collective playwrights and performers Leon Aureus, Rose Cortez, Nicco Lorenzo, Christine Mangosing, Nadine Villasin captured a nation in transition and the triumph of the Filipino spirit. Direction/dramaturgy by Dora-nominated Nina Lee Aquino. Choreography by Clare Preuss. Set Design by Dora award-winning Camellia Koo. Lighting by Arun Srivinasan. Sound Design by Dora-nominated Romeo Candido. Costume Design by Caroline Mangosing. Stage Management by Lindsay Ryan. Courtesy of the lovely folks at the Fringe Toronto offices, we now have our show schedule. Advance tickets are $10 and will go on sale in mid-June. Stay tuned! 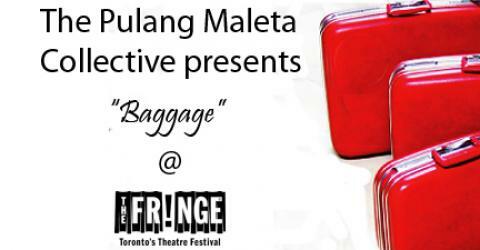 Five playwrights drawing from their distinct backgrounds in film, dance, poetry and music form the Pulang Maleta Collective and share their stories in their debut piece, BAGGAGE. “Maria”- A woman’s struggle between filial obligation and the desire for a new life through a mailorder-bride arrangement. “not my exotic”- Sunshine encounters a guy who is interested in a lot more than a one-night stand. “The Edge of Family”- Crime, dinner and an envious mother exacerbate the decision of a young girl and her two men. “Touch” – A young woman tries to navigate the world as a new lesbian. Her mentor, a Filipino drag queen, helps her try and find love and more importantly learn how to breathe. “Claim Your Baggage” A humorous look at cultural shame and a reminder that if you don’t look back at where you came from, you’ll never get to where you’re going.